Back row (l-r): Mrs. Brenda Winward, Michael Hollis, Jamey Price, Amber King, Tracy Hitt, Danny Wright, Bobie Jones, Nicole Catmull; Middle Row: Nathan Jones, Adrianne Neibaur, Jerilynn Parks, Karlene Hansen, Lindsay Osterhout, Bonnie Torix, Conrad May; Front Row: Andrew Morgan, Matt Robbins, Amy Woodward, Alex Madrigal, Eric Zarybnisky, David Rios, Shana Thompson, Ivan Young, Paul Ross. 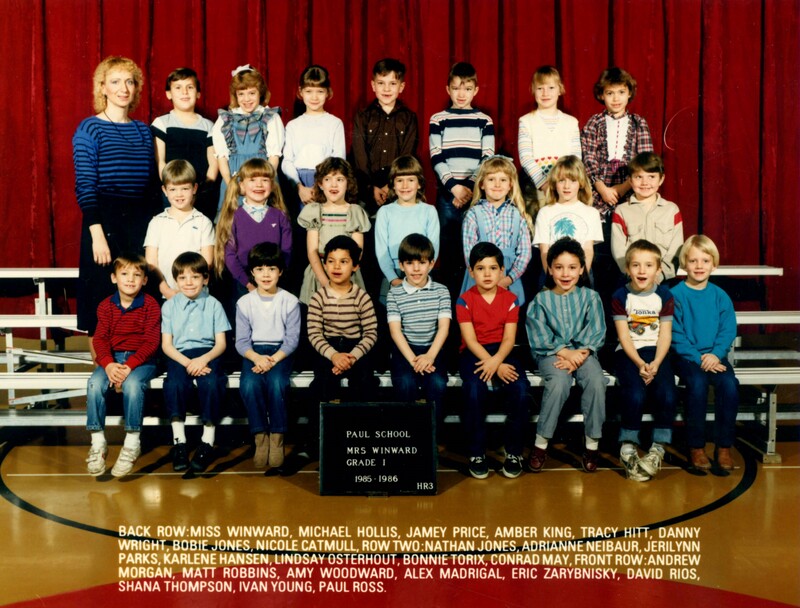 This is our 1st grade class picture from Paul Elementary, Paul, Idaho. This was the 1985 – 1986 school year. Normally I organized photos with married names and dates. Since all are still alive, I will forgo any of the dates. I have added the married last name for the ones I know. If you have corrections, please let me know. I have a couple of memories about this photo I want to share. Miss Winward graduated high school with my Mom. She would tell me that all the time. Later I knew she married to Ms. Goodsell and apparently moved away to Mountain Home or somewhere that direction. I remember cheating off Jamey Price, who sat next to me. I struggled with math and I seem to remember she let me. Well, I got busted at some point. My Mom sat me down for hours and hours and taught me how to count with cigarettes. She got some flashcards and we slaved to make sure I knew how to do basic math. By the time 3rd grade rolled around, I was a whiz at math and Ben Frank was my competition for speed on the multiplication tables. I remember having a bit of a crush on Jamey too. Another kid, whose last name was Bailey is not in this picture. I remember he would eat crayons and play with the Elmers glue on the knees of his pants. Jake? This is the only year I remember having naps. Finding a little place to lay down, relax, and catch a few z’s. Back (l-r): Mrs. Elaine Mayes, Bobie Jones, Justin Orr, Archie Winnett, Benjamin Wilcher, Kyle McCoy, Erin Zemke, Cody Strunk, Amanda Moore; Middle: Danny Wright, Jesse Jensen, Nathan Jones, Traci Gibbons, Paul Ross, Erica Jones, Shana Thompson, Brett Whiting; Front: Charlyn Robertson, Alissa Anderson, Kaleb Winn, Kimberly Isham, Kevin Orton, Cherrylin Tolle, Ivan Young, Leslie Durfee, Gina Chapa, Tasha Martsch. 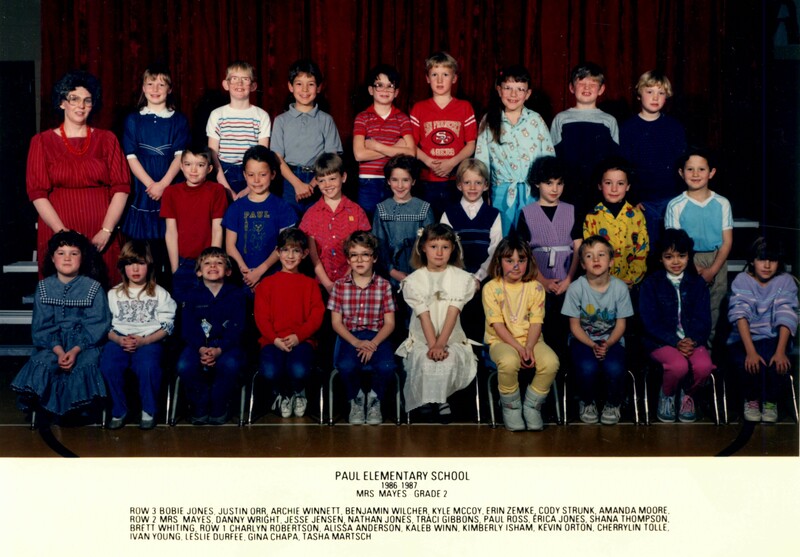 This is my 2nd grade class from Paul Elementary, Paul, Idaho. This was the 1986 – 1987 school year. Normally I go through and organize these photos with married names and dates. I will forgo the dates since we are all alive as far as I know. For the women, I added married names. If you have corrections or updates, I am happy to add. Front (l-r):Genevive Olivas, Jennifer Gebauer, Cody Strunk, Bryan Jensen, Shane Hossfeld, Paul Ross. Second: Mrs. Bonnie Willis, Amber King, Colleen Harper, Jalene Woodward, Mandy Ball, Bobie Jones, Joel Munoz, Michael Hollis. Third: Grace Williams, Karlene Hansen, Traci Gibbons, Brett Whiting, Alfonso Navarro, Beau Twiss, Jesse Jensen. Back: Kyle McCoy, James McKenzie, Jim Cueva, Patrick Adams, Max Bailey, Rigo Arteaga. 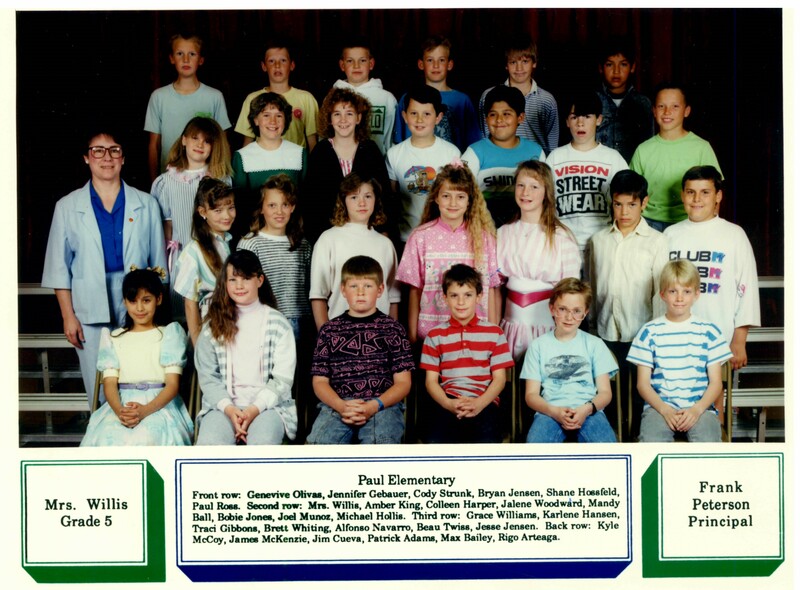 This is my 5th grade class from Paul Elementary, Paul, Idaho. 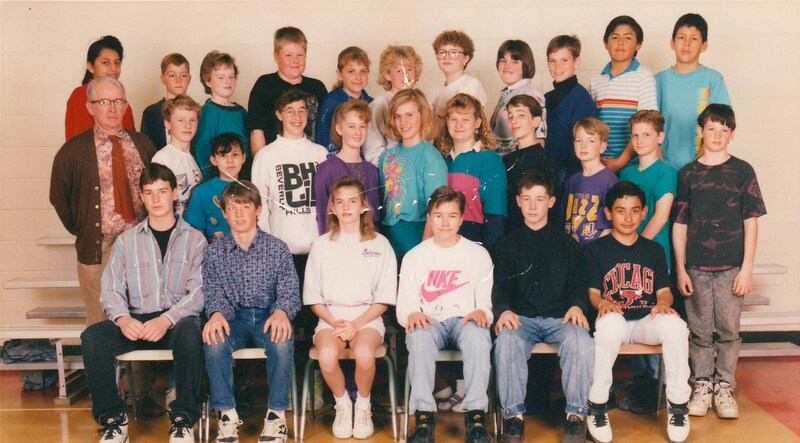 I believe this was the 1989 – 1990 school year. Back (l-r): Merila Paz, Eldon Wright, Ramona Moss, Larry Story, Sara Ferguson, Andra Ross, Audrey Grant, Leslie Patterson, Brad Shockey, Jose Sanchez, Oscar Leos. Middle: James Mendenhall, Russell Parker, Melissa Alvarez, Jolyn Jones, Julianne Greer, Kristal West, Alissa Jolley, Anthony Knopp, Shane Murphy, Dean Elison, Chris Anderson. Front: Matt Albertson, Seth Woodland, Kim Hilterbrand, Mark Kniep, Barry Hall, Juan Solarez.